Few are the times when something that you have thought of gets reflected in someone else's creation. The coincidence of views bring a unique kind of happiness. I had written a blog on Reincarnation and science (click here), where I tried to understand what reincarnation is from a scientific logical thinking, well the book that I read today was absolutely entirely viewing everything in a similar light. God's Debris comes from the man who I think has given one of the best management books of our times - The Dilbert Principle. His style of writing is as simple as the way he has written the Dilbert . This book too like Dilbert tries to cover everything in its entirety. The book gives a solid philosophical point of view, that might interest the reader as he keeps on moving from one page to other. The book has been written in the form of dialogues, which reminds me of nothing else but Plato and Aristotle. 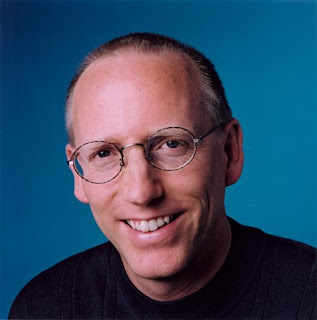 Scott Adams comes up with a philosophical piece that in its content, as is noticed by critics, has been strongly influenced by the Hindu scirputres, vedantas and the concepts of Karma, Avtaar etc. are seen throughout the book. Making a philosophical note, based on culturally different scriptures, and making it concise and understandable for everyone is no small feat. The book precisely achieves that and more. In a very simple manner, Adams has depicted a dialogue between an Old man and a young to list down and talk of those hunderds of things that we keep thinking of. who are we? who is god? does god exist or is it just a concept? what controls our mind? what is soul? who governs our actions? Do we have a free will? Are we more important then rocks, rivers, plants as living beings? how should one's life be? what is awareness? The list of questions that he has asked and that he has answered in his own way is definitely interesting. The concept behind the book was something that impressed me the most. What Adams say in one of the most important chapters of the book is, what / who is God? At the very first glance considering god as nothing but dust and probability sounds absolutely absurd but a detailed dialogue on it makes us think in a line that we might not have thought before. Its the very improbable situation of getting hit by a lightening for example that keeps our life running. It is the high probability of living. There are odds and the way we need to live the life is to support the odds that goes for common good. For an Omnipresent, Omnipotent God, who knows the future and the past, who knows his decisions and the aftermath of his actions, who knows everything that is there to know, who can do anything that he wishes to, who can create, who can change, there are no major challenges. The only curiousity / challenge that he could have is to know what would his creation be if he is not there. It is this self destruction that god has imposed on himself creating the universe with his fragment (an idea of big bang). In that sense we are all God's Debris. And it is this debris that is coming together to form him again and hence the motto of our life should be to live a life that aids the creation of GOD. At the end of the book, Adams tries to put forward a concept of Awareness that could help us deal with the philosophical and worldly issues in a better manner. The basic idea for the book is that the mind creates delusion, delusion to tackle the things unknown. Delusion to explain the unexplained. We consider most of the information that comes to us as true as it comes from sources which we believe are factually correct. we never question our assumptions. These assumptions that our minds construe creates delusion. Our minds hence is nothing but a delusion generator. Delusions help in simplifying things and understand the practicality, hence they are important and useful. Only important thing about awareness is hence to know the delusions for the way they are. He hence divides people into 5 levels of awareness : From the very basic level of just being aware about our existence to the Avtaar level where we figure out our delusion generating machine correctly. And it is the Avtaar level where the main purpose of being is to serve. One can be equally useful being in each level and there is no inherent superiority of a layer on the other. Lower level brings happiness and higher level brings disenchantment. Based on these above concepts the book discusses various social issues and understanding of these issues. Some of the things discussed with the above concepts and coming to logically understand the concepts are Free will and the concept of its existence, Science as we know it, the concept of soul, mind and ideas that we have, Reincarnation UFOs and GOD -all are but a concept, God's motivation, God's debris and its physics, Skeptics disease - irrational thinking, Understanding the concepts of light, concept of ESP, will power, Understanding actions required in living life the way it has to be lived and so on. The later part of the book, especially the last 3-4 chapters seems to be unconnected to the things that Adams discsses in the earlier chapter. The social usefulness of awareness is defined and discsussed well, but its connection to God's Debris is not entirely explained. At few times the sentences explaining the concepts become too long and complex to understand. Lastly, It would have been great if Adams would have kept a dialogue on how can we with our understanding of probability and God's existence make a difference. The concept of fear, knowledge, rationalism, Goodness all could have been discussed in a little more detail. Overall, the book comes out to be simply fantastic and it according to me is must read for any one who wants to delve a little in developing his own philosophy. The book will question you, move you make you think and wonder, make you rejoice in appreciating something you knew. It makes a great read which does not drag and keeps the point up in less than 150 pages. A definte 3.5* for the book from my side. 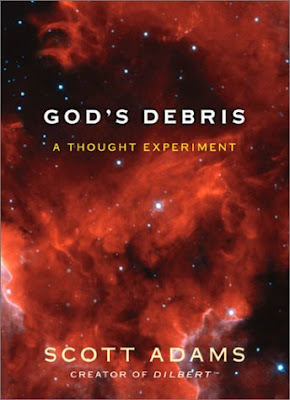 Free E-Book: To download the free E-book of "God's debris" please click here. I am not sure which site it is and whether or not it is a legally free copy but it does have a PDF for the book. I'd like to first congratulate you for your well written and informative blog! I thoroughly enjoyed!!! I am these days wanting to read or rather enjoy a good book written about mughals(from the very beginning). Being a blogger myself- anything which doesnt satisfy the mental thirst of understanding the subject is absolutely a big No!! From your blog, I got an impression that you are a well read man, hence it would be great if you can help me with the name of the book which you think is -excellent!! בית מלון [url=http://www.kfarbair.com]כפר בעיר[/url] - אווירה כפרית, [url=http://www.kfarbair.com/about.html]חדרים[/url] מרווחים, שירות חדרים, אינטימיות, שלווה, [url=http://kfarbair.com/services.html]שקט[/url] . אנחנו מספקים שירותי אירוח מיוחדים גם יש במקום שירות חדרים המכיל [url=http://www.kfarbair.com/eng/index.html]סעודות רומנטיות[/url] במחירים מפתיעים אשר מוגשות ישירות לחדרכם.